The cairn is made of sandstone with three bronze plaques. One reads: “Centenary of the Water Board – unveiled 23rd September, 1988 and the Dedication of Centennial Park." The last shaft site in a sequence of shafts and tunnels is located adjacent to the mark at the fence. In 1827 the governor accepted a proposal from surveyor John Busby to tunnel through from the Lachlan Swamp to Hyde Park. The tunnel, which became known as Busby’s Bore, was built by convicts and took ten years to complete, partly because Busby was not a good manager of what he called his ‘vicious, drunken and idle’ workforce. 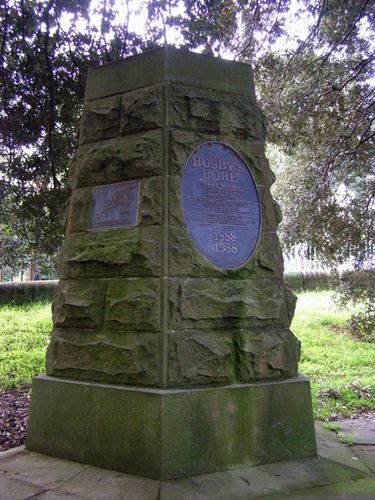 As the project limped along year after year wags about town came to refer to John Busby as the ‘Great Bore’.